← London 2012, Women’s Pool A: Great Britain 1-2 Netherlands. 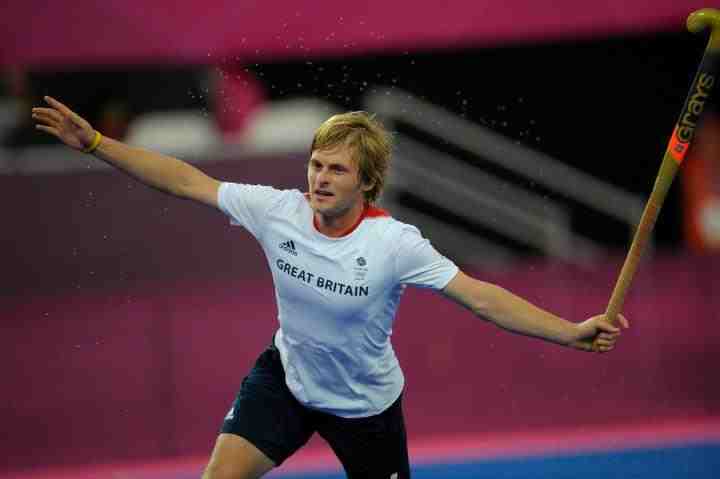 London 2012 Men’s Pool A: Great Britain 1-1 Spain. A splendid goalkeeping display from Cannock’s James Fair ensured Great Britain clung on for a tense draw and secured their first Olympic semi final spot since 1988. After Australia’s demolition of Pakistan earlier in the day, both sides knew that it was between them for the second qualification position. Spain needed a win, whilst a draw would be enough for the hosts. Both sides started in tentative fashion, knowing that the stakes for the game were high, however after five minutes Great Britain won a penalty corner after Glenn Kirkham drew a foot from Alexandre Fabregas. With everyone expecting a drag flick from Ashley Jackson, it was instead James Tindall whose effort was well saved by Quico Cortes before Jackson sent the rebound wide. Jackson was involved again in his team’s attacking efforts when his excellent run and low cross was cleared by Cortes with none of Great Britain’s forwards reacting quickly enough to the situation. Spain finally managed to force some pressure of their own and won a penalty corner on 23 minutes. A well-worked routine saw Xavi Lleonart shoot, but he was kept out by Fair with Iain Lewers clearing the danger. The game was becoming increasingly cat and mouse with the hosts dominating the possession and Spain content to keep them at bay. Harry Martin went close when he deflected the ball goal wards from a pass into the circle but he could get neither the power nor the accuracy to trouble Cortes. Eddie Tubau swapped passes with Pau Quemada and looked set to shoot at goal, but he was eased off the ball by Ali Wilson and James Fair was able to clear. With time running out in the half Great Britain won another penalty corner. This time it was Jackson who flicked for goal, sending a bullet into the bottom corner to give Cortes no chance and Great Britain the lead. The almost snatched another goal before half time, James Tindall’s snap shot was superbly diverted over the top by Cortes. Straight after the restart Tubau seized on a defensive mistake and burst into the D. Fair was equal to the task and repelled his shot with his glove. Spain were looking dangerous and Quemada and Tubau were linking up well, but just unable to find the final pass. Great Britain forced another penalty corner. Jackson went for goal but his shot was charged down. Barry Middleton hit the rebound goal wards, but it cannoned off a combination of Tindall and the defender’s stick and somehow hit the crossbar. In the 54th minute, Spain hauled themselves level. Harry Martin was deemed to have fouled in the D, and despite Great Britain’s referral the penalty corner was given. Quemada stepped up and levelled the scores with an unstoppable low flick into the corner. There was a marked change in atmosphere amongst the home crowd as an air of uncertainty began to creep in. This seemed to spread to the players and Spain began to impose themselves as Great Britain retreated in an attempt to hang onto their semi final place. 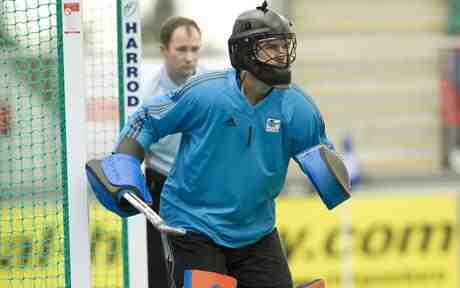 Spain forced a series of penalty corners: First James Fair got the slightest touch to a drag flick to touch it wide. Then, the visitors pulled another corner past the post. With the tension reaching unbearable levels for the home fans, Fair kept out another corner with a good save. 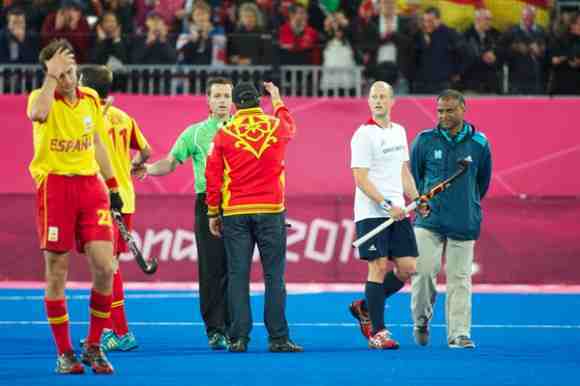 With the drama still not over, Spain thought they had won two penalty corners in the dying moments, only for them to be overturned on consultation between the umpires. The Spanish players and Coach Dani Martin were left furious suggesting they had been denied by foul play and not by Great Britain’s abilities on the pitch. The home supporters will not care about any of that as their side go into Thursday’s semi-final with The Netherlands, whilst Spain have to content themselves with the classification matches instead. A night of high drama, with no doubt more to come from what has been a superb tournament so far.